Mac® mini computers make sweet servers for most applications. However, integrating them into a rack poses some challenges. How do you securely mount the minis? How do you keep them cool? How do you turn them on without pulling them out of the rack? How do you plug in a thumb drive for a quick update? Sonnet's RackMac™ mini solves all these challenges and more. 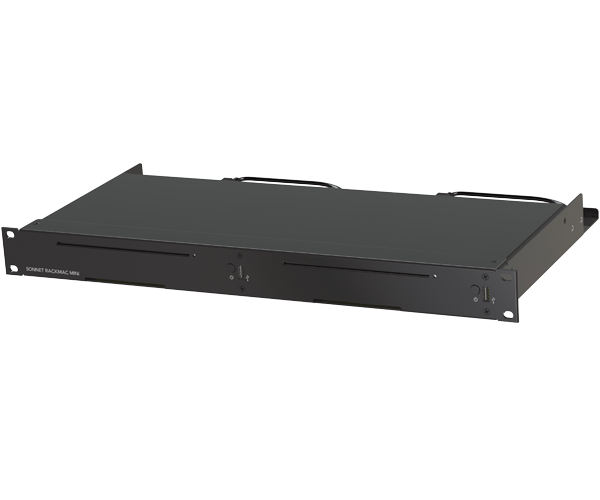 This fully-assembled rackmount solution for the latest line of Mac mini servers and computers supports the installation of one or two Mac minis side-by-side into 1U of rack space. Constructed of rugged steel, the RackMac mini places the computers behind a smart front panel. The RackMac mini's design manages airflow through the computers to keep them as cool as ambient air. Stack them close and stack them high for a Mac mini server farm. The RackMac mini provides a front panel power switch and front panel USB 3.0 port for each computer; built in panel-mount cables connect the ports to your computers' USB ports. Shown without top cover; Mac mini computers shown in photo not included.